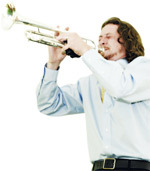 Originally from Saratoga Springs, trumpeter and composer Bryson Barnes received his bachelor’s degree in studio music and jazz from the University of Miami before moving to Montreal to pursue a master’s degree in music performance at McGill University. While there, Bryson directed the McGill Jazz Orchestra III and taught jazz theory while performing around the Northeast with Burlington-based pop/soul powerhouse Strength in Numbers. Just back from the 2010 Banff Centre residency in jazz and creative music, Bryson splits his time between Montreal and Saratoga Springs, and performs in and composes for a variety of jazz and popular music settings.